Want to give a great speech at work, in the community or on the campaign trail? There’s one big question you must answer first before putting pen to paper. 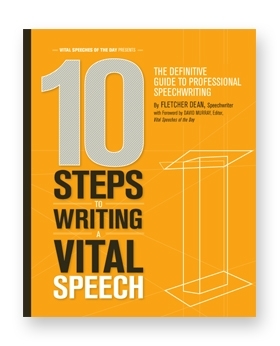 Know thy audience is the first of 10 steps in crafting a vital speech, says author and award-winning speechwriter Fletcher Dean in his must-read guide. “For a speech or presentation to be successful, you need to talk to the individuals in the audience about ideas and concepts they’re interested in,” says Dean. When you don’t know who’s in the audience or what’s on their minds, your speech will have all the warmth of a love letter addressed to whom it may concern. When you don’t care about your audience, your audience won’t care about you. Your brilliant insights and calls to action will be ignored. So do your homework. What does your audience like and dislike? How do they view the world? What are their hot button issues? Where do you have common ground, mutual interests and shared values? Which one of their problems can you solve? Once you’ve figured out what your audience wants to hear and what you need to say, you need to deliver your key message in a way that’s easily understood. Stories entertain and inform and can win you both hearts and minds. So what stories should you tell? If you’re a new leader or political hopeful, the “who I am” story is a must. Your audience won’t follow you until they know you, like you and trust you. And then there are teaching stories. Tell inspirational stories about your customers, clients and patients. Share stories about frontline staff who solved a problem and ordinary people in our community who’ve done extraordinary things. If you want to grab your audience’s attention, skip the usual greetings and salutations at the front end of your speech and launch right into your story. Once you’ve got your messages and stories on paper, ruthlessly edit. “Be hard on yourself, be willing to kill all of your darling phrases that don’t work,” says Dean. You need a speech that delivers on three fronts. It needs to be simple and clear. Exciting and fresh. And warm and personal. Strip out unnecessary words and jargon that muddies your message. Go easy on facts and stats, rounding up wherever possible. Put some punch in your speech by asking rhetorical questions, inserting rhythmic triads (sets of three), changing up the length of your sentences and embracing word play. Allow alliteration always, says Dean. Use self-deprecating humour to show humility and openness. But whatever you do, don’t joke about your ineptitude when it comes to public speaking. “Speakers who make light of their speaking abilities demonstrate an enormous lack of confidence and are extremely dispiriting,” cautions Dean. After all, a great speech is never about you. From beginning to end, a vital speech is always about your audience, their hopes and dreams. This review first ran in the Nov. 5 edition of The Hamilton Spectator. Nothing’s quite as painful or predictable as the deadly silence that follows the end of a presentation at work. With much enthusiasm and in great detail, a project leader has just pitched a bold and brilliant plan to solve a problem or seize an opportunity for your organization. The presentation ends with an open invitation to ask questions. If we’re not drifting off or texting away, we’re checking the clock and praying for an early exit. We shoot daggers at colleagues who appear tempted to ask questions if only to hear the sound of their voices and remind us that they’re the smartest ones in the room. But what if we went to the next presentation and acted like a bunch of three year olds? What if we all put up our hands to ask questions? What if we fearlessly asked the obvious and dumb questions that everyone’s thinking? What if we admitted that we didn’t understand three-quarters of what we just heard? And what if we found the courage to ask whether we’ve come up with a bold and brilliant solution to the wrong problem? Chances are, we’d become a far more innovative organization. “As a business journalist, I’ve had the opportunity to interview a lot of people who’ve come up with a new product or service, or who’ve found a new way to run an organization,” says Amanda Lang, author of The Power of Why, co-chost of The Lang & O’Leary Exchange and senior business correspondent with CBC News. Kids are naturally curious, says Lang. They ignore conventional wisdom and love to figure things out for themselves. They question, challenge and test everything. So what happens to those kids? Lang says they head off to school where we do a spectacular job of educating them out of their curiosity. As one researcher puts it, we’ve adopted a pedagogy of intellectual hide and seek. The teacher holds all the right answers. It’s up to the students to find the answers, memorize them and parrot them back. 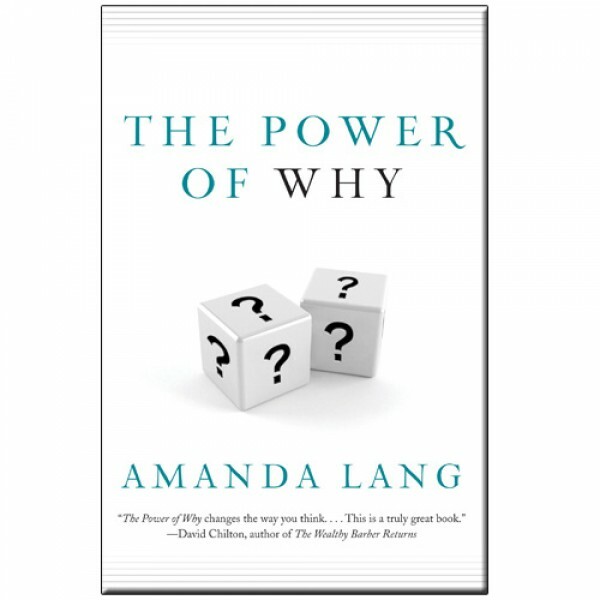 “As the educational system is currently constructed, the right answer, not the cheeky question, gets the gold star – and the faster you get that answer, the better,” says Lang. Lang says the same dynamic of rewarding right answers, punishing wrong answers and not recognizing good questions repeats in the workplace. But here’s the problem. If you want innovation, you have to be curious. You need to ask a lot of questions, challenge assumptions and work through a lot of wrong answers. “There isn’t a story of innovation or progress that doesn’t involve multiple false starts and flubs,” says Lang. Our economy is driven by innovation. Our prosperity rests on the constant discovery of better products and services and smarter ways to get the job done. Innovation also renders obsolete much of what we already know. “The world is changing so rapidly that by the time a student graduates from university, everything he or she learned may already be headed toward obsolescence,” says Lang. “The main thing that a student needs to know is not what to think but how to think in order to face new challenges and solve new problems. So that’s our challenge in our schools, at work and on the home front. We need to do a far better job of fostering, recognizing and rewarding curiosity and divergent thinking. For inspiration, Lang profiles some exceptional innovators, from the creator of a table saw that won’t amputate your fingers to four young women who turned a soccer ball into a power source for children and families living in developing countries. Lang’s book will help you rediscover the three-year-old version of yourself who was so fearlessly and insatiably curious.